This post is sponsored, but all opinions are mine alone. To date, volunteers have made more than ONE BILLION historic records searchable online since FamilySearch first introduced online indexing back in 2008. The demand continues to grow as millions more historical records worldwide are added each year. Head OVER HERE to join 72,000 teammates in saving the world’s records! Did you know that FamilySearch International is the largest genealogy organization in the world? Pretty awesome, rigth? It’s a non-profit, volunteer-driven organization sponsored by The Church of Jesus Christ of Latter-Day Saints. 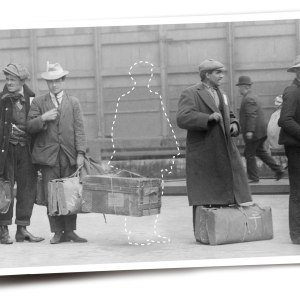 They’ve been actively gathering, preserving and sharing genealogical records worldwide for over 100 years! People can access FamilySearch services and resources for FREE online at FamilySearch.org – or at over 4,921 family history centers in 129 countries. Join Worldwide Indexing Day and help FamilySearch preserving world records! *I received the pdfs for these printables free of charge. All of the thoughts and opinions in this post are entirely my own. See my disclosure policy here. If you’ve noticed, lately I’ve mentioned a big family event where a ton of friends and relatives flew in. Well, Wonder Woman was baptized into the Church of Jesus Christ of Latter Day Saints! Such a special event, and we were so blessed to have many loved ones there. One thing that helped that whole day, even the luncheon, be so pretty, fun and down-right awesome were these adorable LDS Baptism Printables from A Pocket Full of Pixels! See how everyone left a fingerprint in different colors, then just sign by it. It’s now framed and proudly displayed in her bedroom. It serves as decor, a reminder of how many people love her, and also of her special day and the religious covenants she made that day. I love it! Isn’t that so fun?! Of course Kara provides different colors and boy/girl can certainly be changed. We had a TON of water bottles on-hand, but I didn’t want to have a boring drink display….luckily A Pocket Full of Pixels has these Baptism Water Bottle Labels, too! I didn’t do cupcakes for our party to use these Baptism Cupcake Toppers, but I did make cookie sandwiches that needed their cuteness factor upped a bit. Worked perfectly! The green ‘Congratulations’ topper is customized with the child’s name…I blotted it out for these photos. Kara has so many more adorable baptism items and options in A Pocket Full of Pixels, that you can certainly find the perfect thing! 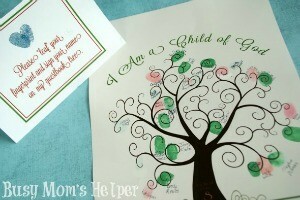 Many of these baptism printables here are also in a fun Chalkboard design. If you want a customized program for the event, she can do so many cute things with it! She even has things such as this super-cute Halloween Party Chalkboard-Style Invitation! If you need bunting banners, Baptism Subway Art, invitations, or even Bridal or Baby Shower items, you definitely need to check out Kara at A Pocket Full a Pixels! My sweet little niece just got baptized this month, and we wanted to give her something simple-yet-cute, and something to help remind her of her promises to Choose The Right (CTR). This DIY Baptism Pillow Gift turned out so beautiful and soft, and I loved how easy it was to make! I probably don’t share this nearly as much as I should, but for those that don’t know: I’m LDS. That is, I’m a member of the Church of Jesus Christ of Latter-Day Saints. In my church, once someone reaches the age of 8 they may choose to be baptized into the church. We bless infants, but one cannot be baptized until they reach 8 years old. Last month my oldest niece turned 8 years old, and chose to be baptized last Saturday. It was such a special day, and we’re glad to have been included. One thing our primary children in our church (or anyone, for that matter) likes is CTR, which stands for Choose The Right. You’ll often see LDS members wearing CTR rings, and that’s why. It reminds us of our promises to always Choose The Right. 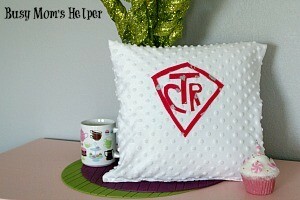 So this DIY Baptism Pillow Gift was the perfect thing for ‘K’ to have on her bed or in her room to remind her. And the minky fabric sure made it soft and snuggly….bonus! Cut your fabric to fit your pillow. Keep in mind the thickness of the pillow, and allow room for seams. Try to keep one edge of the pillow as a folded edge, leaving just 3 edges to sew. This folded top edge will be the top, since that’s the most seen and will leave it extra pretty and clean looking. So the folded edge is the top. Face the pretty side of the fabric together and sew your two SIDE seems. Cut off the excess fabric from the seam. Turn your case right-side out. Cut out your symbol and CTR letters. NOTE: If you want to sew your symbol/CTR onto the case instead of hot glue it, sew it one now before putting in the pillow and sewing the last edge. Stick your pillow into the case and sew your last edge. Cut off the excess fabric from the seem so it looks as nice and clean as possible. If you’ve already sewn on your symbol and CTR letters, you’re done! If not, this is when you hot glue them onto the front of your pillow. Keep in mind the pretty folded edge is the top! I love how this pillow turned out, and she was thrilled to have something aside from her CTR ring (that she got from grandma) to remind her of her special day!